Fronts – The 3200 Series shock is a small body mono-tube (gas) shock with a hard black anodized aluminum body. This shock uses CNC machined aluminum internal parts designed for racing with no aftermarket parts. 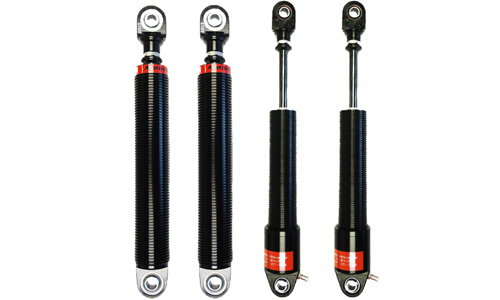 These shocks contain the latest T/C valving for maximum traction. They come in either A or B-Model Cockpit Adjustable. The base valve design in this shock allows for very low gas pressure to be used and still function properly. This shock has a Schrader valve that will accept 10-100lbs. gas pressure which provides for fine tuning of the chassis balance. The small body shock accepts 1 7/8”, 2 ¼” & 2 ½” I.D. Spring & is available in 5”, 6”, 7”, 8” & 9” shaft lengths. Rears – The 3200 Series shock is a small body mono-tube (gas) shock with a hard black anodized aluminum body and canister. This shock uses CNC machined aluminum internal parts designed for racing with no aftermarket parts. These shocks contain the latest T/C valving for maximum traction. This shock comes in A or B-Model Cockpit Adjustable. The base valve design in this shock allows for very low gas pressure to be used and still function properly. When combined with our canister option and the ability to run low rod pressure this shock has virtually no rod pressure build up and allows for maximum grip a driver can feel. This shock allows the racer to adjust the rebound and compression dampening completely independently. This shock allows for the rebound to be adjusted at the eye of the shock and the compression to be adjusted on the remote canister of the shock. This shock has a Schrader valve that allows fine tuning of the gas pressure which provides for fine tuning of the chassis balance. This shock will eliminate the need for extra shock inventory by creating one shock for each corner of your car. The small body shock accepts 1 7/8”, 2 ¼” & 2 ½” I.D. Spring & is available in 5”, 6”, 7”, 8” & 9” shaft lengths. 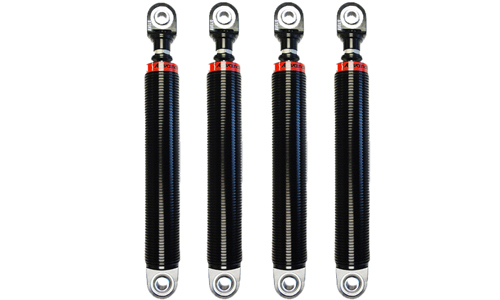 Fronts – The 1000 Series Shock is a small body twin tube with a hard black anodized aluminum body. This shock uses CNC machined aluminum internal parts designed for racing with no aftermarket parts. This shock utilizes aluminum billet pistons and base valve assemblies to provide the most consistent performance. 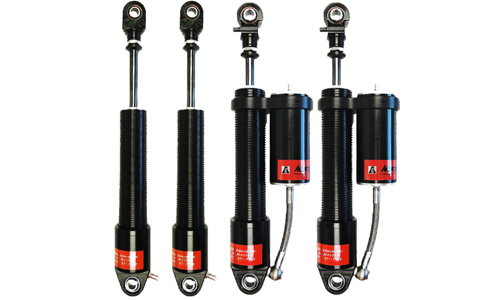 The small body twin tube shocks are available with many different valving combinations. This shock is a E-Model Eye Adjustable shock. This shock accepts 1 7/8″ I.D,. 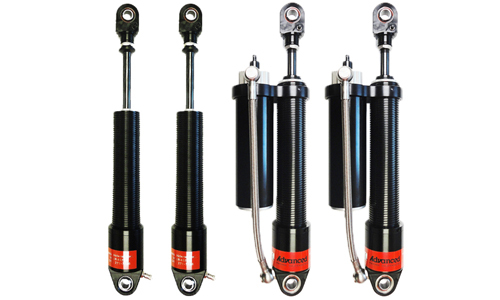 Sprints & is available in 5″, 6″, 7″, 8″ & 9″ Shaft Lengths. 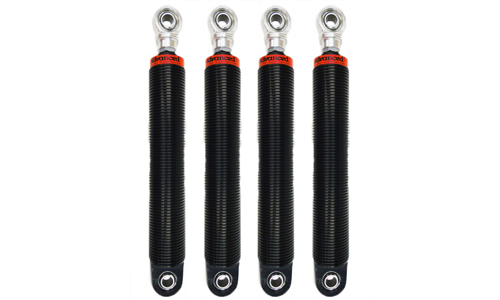 Fronts – The 3200 Series shock is a small body mono-tube (gas) shock with a hard black anodized aluminum body. This shock uses CNC machined aluminum internal parts designed for racing with no aftermarket parts. These shocks contain the latest T/C valving for maximum traction. They come in either A or B-Model Cockpit Adjustable. The base valve design in this shock allows for very low gas pressure to be used and still function properly. This shock has a Schrader valve that will accept 10-100lbs. gas pressure which provides for fine tuning of the chassis balance. The small body shock accepts 1 7/8”, 2 ¼” & 2 ½” I.D. Spring & is available in 5”, 6”, 7”, 8” & 9” shaft lengths.